Upgrading from a Nauticast AIS, Saab R4, Oceansat or L3 Inland transponder? The single-box design with integrated color display allows for easy installation. 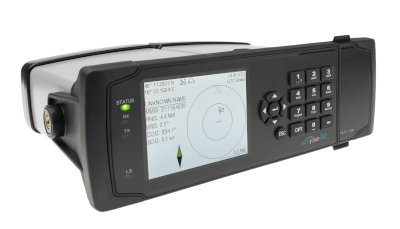 RS232/RS422 interfaces (NMEA 0183) and pilot plug guarantee seamless integration into all other ship systems. Many professionals regard the NAUTICAST A2 as the most reliable device in its class. It fulfills all currently available specifications for SOLAS and INLAND AIS as outlined by main authorities such as IMO, ITU, IEC and CCNR. It is Wheelmark approved by BSH in compliance with ITU regulation 1371-5, is FCC and USCG certified and Inland AIS approved according to CCNR testing standard 2.0.